Successfully Added Portable Security Box - Executive Biometric Fingerprint Safe to your Shopping Cart. Worried about misplacing that new Swarovski necklace you just bought? Afraid your jealous mother-in-law will cause you to "accidentally" lose it? What if your dog gets its jaws on the thing... what a nightmare. 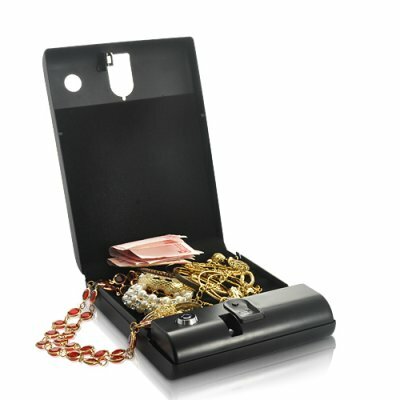 Well feel at ease with this impenetrable portable security box. This biometric fingerprint safe is built with a thick, high grade 16-gauge cold rolled steel and thick memory retentive foam interior. It also comes with a high-strength security cable that secures it to furnishings in your home, car, RV, office or motel, giving you double the protection. This fingerprint security box is a very easy and secure way to store your valuables. The fingerprint system uses a single finger swipe as its locking mechanism and can handle a maximum of 200 fingerprint templates. Just register your fingerprint (and those of other trusted people) and you have the most secure and theft-proof way to keep objects safe. Now everyone can store their belongings easily in even the most restrictive of spaces. This executive class biometric safe box is in stock now at an amazing factory direct wholesale price. Get yours today for complete peace of mind straight from the leaders in wholesale electronics, Chinavasion. Quarter-turn lock comes with 2 keys which can be used as additional security to your lock box and if there are no registered prints then it can be opened with the key. Fingerprint identification employed by the Biometric Storage Box involves comparing the pattern of ridges and furrows on the fingertips, as well as the characteristics that occur when a ridge splits into two, of a specimen print with the master fingerprint on file. Will the Bio-metric fingerprint safe be as secure using a key rather than fingerprint? Yes, both the fingerprint lock and the key lock are equally secured. You can either choose to secure the Bio-metric safe with your fingerprint, key or both for maximum security. Can I store more than one finger print? Yes, you can store up to 200 additional fingerprints.